The EU’s General Data Protection Regulations (GDPR) take effect May 25 and we are fully behind the spirit of these regulations for a safe and secure Internet. We collect basic contact information to allow you access to our membership site. This includes contact details like email address and name in order to support membership login, content access and other account management functions. When accessing our Website, Paint By Number For Adults will learn certain information about you during your visit. When you log in, we will also set up several cookies to save your login information and your screen display choices. Login cookies last for two days, and screen options cookies last for a year. If you select “Remember Me”, your login will persist for two weeks. If you log out of your account, the login cookies will be removed.If you edit or publish an article, an additional cookie will be saved in your browser. This cookie includes no personal data and simply indicates the post ID of the article you just edited. It expires after 1 day. Another tool we use to help us with our website analytic information is Statcounter. Statcounter gives us traffic information in the aggregate only, such as: how many people visited a particular page on our website, where people are from, devices they use to access our site and so on. These buttons help you share web content directly from our web pages to these social Media Platforms via your own account/profile. These companies do track your interests, and will use the profile they develop on you for their own purposes. Users should be mindful, that this could include giving 3rd parties access to your personal profile. Users should therefore use the social sharing buttons at their own discretion, and only to the degree that they are comfortable with the privacy policies for these platforms. We have included links to the privacy policies for these social media. Cookies are also used by Google Analytics on this site as described in the next section. You should consult the respective privacy policies of these third party ad servers for more detailed information on their practices as well as for instructions about how to opt-out of certain practices. Paint By Number For Adults may engage in affiliate marketing, which is done by embedding tracking links into the Website. 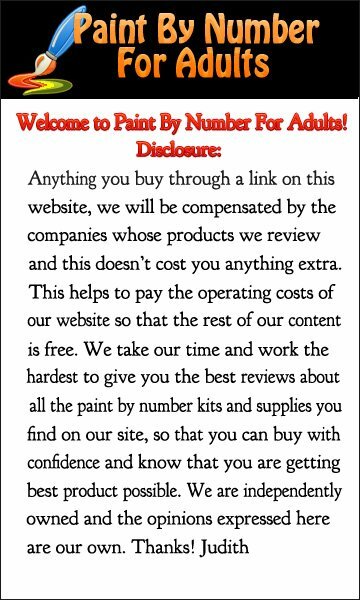 Paint By Number For Adults is a participant in the Amazon Services LLC Associates Program, an affiliate advertising program designed to provide a means for sites to earn advertising fees by advertising and links to Amazon.com. As part of this Amazon Associates program, the Website will post customized links, provided by Amazon, to track the referrals to their website. This program utilizes cookies to track visits for the purposes of assigning commission on any sales. Paint By Number For Adults will not obtain personally-identifying information about you when you visit our site, unless you choose to provide such information to us, nor will such information be sold or otherwise transferred to unaffiliated third parties without the approval of the user at the time of collection. Paint By Number For Adults may use software programs to create summary statistics, which are used for such purposes as assessing the number of visitors to the different sections of our site, what information is of most and least interest, determining technical design specifications, and identifying system performance or problem areas. For site security purposes and to ensure that this service remains available to all users, Paint By Number For Adults uses software programs to monitor network traffic to identify unauthorized attempts to upload or change information, or otherwise cause damage.